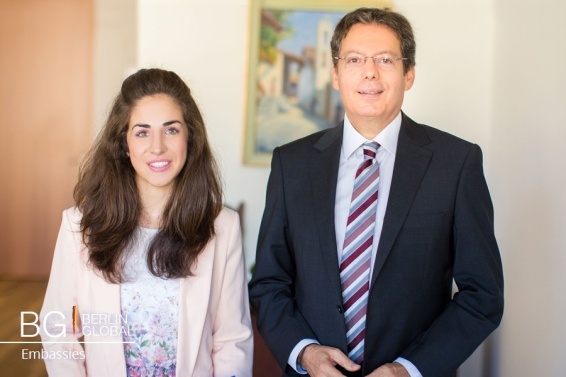 On 26th August 2016, a team from the ICD had the privilege and pleasure to interview His Excellency, Minas Hadjimichael, ambassador of the Democracy of Cyprus to the Federal Republic of Germany. The interview gave us the chance to take a deeper look into the German-Cyprus relations and the elements which characterize them as the closest in the European Union. Also, the ambassador, His Excellency, coming from a country which is divided into two, after the Turkish invasion of 1974, explained us the cultural diplomacy’s contribution to the reunification between the Greek- Cypriot and the Turkish-Cypriot community. You were born in Famagusta and apparently witnessed the tragic moments of the Turkish invasion. Clearly you experienced and are still experiencing the devastating consequences. Do you think that your choice to follow a career in the field of international relations was influenced by your experiences? What were the motives that led you to become a diplomat? Of course I have experienced the Turkish invasion. I had just graduated High School, I was 17, 5 - 18 years old and I was about to start my military service. Then the Turkish invasion occurred and it is true that some scenes have stayed engraved into my mind. I would like to share something personal with you. For many years after the invasion, every time I could see or hear a plane, I recalled all these moments of the Turkish invasion, with the Turkish planes plunging and getting prepared to bomb us. I remember that we were told we should beware of the planes which were exactly opposite to us and not the ones above us, because these were the ones which could machine gun and send a bomb to us. If a plane is above you then the bomb will go farther. So, all these scenes have had an effect on me. Later, after having studied Law and Politics and having deal with Diplomacy and International Law, I was attracted to International Relations. Mr Efstadiadis (well known Greek professor who taught me Law) had taught us that no matter whether you represent a small or a big country, you can always succeed as long as you are capable to convince. A country’s size is not necessarily an inhibitor of claim what you deserve. It depends on the way you practice diplomacy, because finally diplomacy is a form of art and if you learn to practice it well, it can be gratifying. It brings internal pleasure. You have served in various positions: the Ministry of Foreign Affairs of Cyprus, the Council of Europe, the UN, the negotiating committee for the referendum in Cyprus, the Embassy of Cyprus in Greece and France. From what position you believe you gained the most experience and encountered the most difficulties? All job positions have something to add in your experience depending on the position’s nature and on the moment that you are placed in it. For example when I was placed ambassador in Paris in 2002 and remained for five years until 2007, we had to convince Shirak that we were ready to join the European Union. However, it was then that we had the referendum on the Annan plan in which we voted against, for obvious reasons. It was a difficult post because firstly we had to explain why we voted in this way in the referendum. However, after Cyprus’ entry in European Union we could see the change to the position of France regarding the Cyprus Issue. They started to treat us as partners and not as third parties as it was happening previously. The Council of Europe has been very important for me too because my Master Thesis was about the integration theories of the Council of Europe. Being placed in the Council of Europe gave me the opportunity to see how each country acts. The Council of Europe is an intergovernmental organization, which means that one country can block a decision, even if all the other countries agree. This is something that I have experienced regarding the Cyprus Issue, whereas Turkey blocked all the decisions. However, the biggest school for me is the United Nations. In my opinion, everyone who is interested in seeing diplomacy “in action” should go to United Nations! There, even if you come from a small country like Cyprus, you have the opportunity to play an important role as long as you work hard and you create the suitable network and friendships. Through observing the Security Council somebody can get great information about the way countries, especially the big ones, act… Unfortunately sometimes the Charter is being violated due to the big countries’ profits! Coming to the conclusion, United Nations are “the best kept secret in diplomacy”. Although Cyprus is a European country, we belong to the Asian group in New York. Going there as an ambassador gave me the opportunity to associate with countries from the Asian world, therefore I had an advantage compared to my colleagues whose action was limited into the European Union. You can create friendships which prove to be very important if you need a vote! You serve in the position of the ambassador of Cyprus in Berlin. Where do your works focus on? How do you care to promote the interests of Cyprus? The basic work for every ambassador in a foreign country of accreditation is to represent his country. More specifically, ambassadors have to take care of the promotion of his country’s political, commercial, financial and cultural profits. Negotiations are also an important part of an ambassador’s job when there is an agreement to sign. In addition, main part of my job is to inform about the Cyprus Issue, the Cypriot Democracy’s positions about it, the process of the negotiations, what the prospects of a solution are, what the other side’s opinions are, the subjects where we have convergence and how Germany can contribute to the solution of the Cyprus Issue. I contact with the Ministry of Foreign Affairs, with the deputies and regarding to the subject with other ministries as well. I should underline that there is a very strong friendship between Cyprus and Germany which is bipartisan! How do you evaluate the relations between Cyprus and Germany? In what areas do you focus your cooperation and what are the prospects for improvement? I do not like to use grand words but truly our relations are exceptional in all fields. We are partners in European Union and we see “eye to eye” on most of the subjects we discuss. The German Chancellor came to Cyprus and our President came here. We had official meetings with our Minister of Foreign Affairs and Mr Steinmeyer, deputies and delegates. There is a rich variety of bilateral agreements on economic, trade, cultural, educational sector, the aviation sector is very important as well and on shipping. Moreover, there are German companies operating in Cyprus, mainly in shipping and ship management. Also, we organize entrepreneurship seminars, either in Munich or Frankfurt whereas we explain the reasons which make Cyprus a very good destination for investments: for example a German company can have its seat in Cyprus and develop entrepreneurship activities in the Arab World countries, such as Jordan, Lebanon and Egypt etc. This can be beneficial for companies because they reduce the operating costs while they are still in a European country where nothing unprecedented can happen. However, even the best relations can be improved and this is the Embassy’s role. Through dialog, understanding and respect we try to find solutions as partners in European Union. How do you promote the dissemination of Cypriot culture in Germany? We have collaborated with several German Museums where is rich a variety of Cypriot antiquities, as it happens in Neues Museum for example. We utilize our cultural treasures exhibited in these museums. Also, we have helped to enrich the universities’ libraries with Cypriot literary works and books highlighting the history and cultural heritage of Cyprus. Of course cultural diplomacy is not confined to history, archeology or the past. It is something that touches the contemporary cultural creation. There is no doubt that artists are cultural diplomats as well. Those who are the exponents of culture are a large part of a country's culture. In this context, there is a cultural agency operating in the Embassy with the support and the cultural services of the Ministry of Education and Culture. They make remarkable programs and cultural activities on a long term basis to ensure consistency and continuity in a wider context and through activities designed to promote the culture of Cyprus in Germany as well as to promote our contemporary artistic and intellectual creation. We focus not only in Berlin but also in other cities in Germany. There are three cultural institutions that we have created in Germany: The Cypriot Spring in Munich, the Cypriot Moments in Cologne and Bonn and the Cypriot Miniatures in Berlin. We have presented over 200 artists Cypriots, Germans and other nationalities that their themes revolve around Cyprus, through the music sector, poetry, prose, theater, dance. We have presentations, exhibitions, theater, visual arts. In this way we try to spread our culture here. What does "cultural diplomacy" mean for you? What is the Role of Cultural Diplomacy to Cyprus? We are an island that has more than nine thousand years of history and culture. We are at the crossroads of three continents and many cultures. So it is necessary to use the cultural diplomacy tool in our international relations so to strengthen and improve our ties with neighboring countries, to improve the image of Cyprus and to build bridges with other countries and peoples. To put it simply, for us here at the embassy, it is very important to have participations of artists of other nationalities to the cultural programs we do here in Germany. We have participations for example from Germany, Italy, Lithuania, Britain, Sweden, the Czech Republic, Hungary, Netherlands, Russia, France, Greece, Israel, etc. Through such programs we try to build bridges, to overcome any nationalistic boundaries that exist. Cultural policy is for us a double- track road. Cultural exchange and no export of culture is the key for us. We do not want to export our culture. This is what makes our cultural programs special in Germany. We just want to show them what we are and to have an exchange on cultural matters. What is cultural diplomacy’s contribution to strengthening relations between Cyprus and Germany? Up to a certain point it can help. We represent a country which is under occupation the last 45 years. So the main goal of our foreign policy all these years has been the solution of the Cyprus problem, the termination of the Turkish occupation and the reunification of our country. Therefore we try to strengthen our ties with Germany through improving the image of our country and building some bridges. In this way we can spread our messages and raise awareness among the German public. If somebody asks the Germans about Cyprus perhaps they will collect answers such as: "It is a very nice island, there is a Turkish and a Greek part". However reality is harsh... There's invasion, occupation and we have to explain them about all these things and raise awareness. We try to open their horizons and to explain that in the 21st century Cyprus is still divided. The only wall that has remained, after the Berlin Wall in Europe, an anachronism in 2016, exists in Cyprus. Germany has been a divided country in past- like Cyprus today- and through a peaceful revolution it became a symbol of reunification. Regarding Cultural Diplomacy and its use as a tool for dispute resolution and achieving peace, can you give us an example where the cultural dialogue and cultural exchange had successful results for Cyprus at an economic or political level? There have been many attempts between Greek Cypriots and Turkish Cypriots through culture. Mainly, there have been translations of literary works, anthologies’ editions, photo exhibitions, cultural programs etc. These have a positive impact because they show a different face of Cyprus emitting a modern approach. We are preparing a musical evening for the cultural series "Cypriot moments" in Cologne- which we will later present in Berlin too. A Greek pianist and a Turkish cellist will perform together. Of course the Cyprus problem will not be solved only with a successful cultural diplomacy but the positions are certainly more understandable and more accessible when the messages we emit aim at the reunification of our country and the peaceful coexistence of all Cypriots: Greek and Turkish Cypriots. Do you think that education can contribute to the solution of the Cyprus Issue? Have there been similar efforts? If training is meant to be understanding of the concerns, fears, expectations of both sides of the two communities, then yes it is an effort that might help to achieve a solution. BUT, any solution to the Cyprus issue depends only and exclusively on Turkey. This is the reason we say that the solution is within Turkey. Turkey is the country which has an occupying power of 40,000 occupation troops in Cyprus and is holding 37% of the territory of the Republic. So this is the country that practically has to show that wants a solution. We negotiate for a solution to the Cyprus Problem. Our president is a man who has a vision for the reunification of Cyprus. I believe that Mr. Akinci shares the same vision- he has not shown the opposite to us. But let’s be realistic. Whether Mr. Akinci wants it or not- I think he wants, I have no reason to believe the opposite- it is not up to him whether the Turkish troops will leave or not, if they will return the land or a percentage retained back to the Greek Cypriots. It depends on Turkey, and more specifically on Mr. Erdogan. Turkey must give prove that wants Cyprus settlement, which is something that at the moment we do not see. Why do the Turkish Cypriots allow Turkey to control them to such an extent? How is it possible Turkish Cypriots not to allow Turkey intervene? Turkey sustains the Turkish Cypriot community, pays governmental employees’ salaries, brings them water and electricity, offers them security. Indicatively, the most powerful man in the occupied territories is the Turkish General or the self-proclaimed ambassador and not the leader of the Turkish Cypriot community. When there is so much dependence on Turkey, how can Turkish Cypriots lift up their voice and say: "I do not want, stop, go away, leave me?" Maybe through education the Turkish- Cypriot community could understand that their profit is in solving the Cyprus Issue and they would manage to exempt the Turkish control? We try to do joint projects, etc. in order to show that the two communities can live together again. These are very good and make people realize that we all want to live in peace but politics does not let people achieve their dreams. Turkey’s interests and the way they see Cyprus are obstacles. We try to change these. "Turkey was prepared to withdraw from textbooks all negative comments on the Greeks and Greek Cypriots. However, there was no such move by the Greek side, due to obstacles posed by the Church. The Turkish side is more ready. " How would you comment on this statement? On the part of the statement concerning Greece I am not competent to answer. However, concerning Cyprus, for us it the phrase used by Mr. Yaşar Yakis is inaccurate. What is important is to focus on the work done by the Technical Committee for Education established by decision of the two leaders of the two communities in 2015 (Anastasiadi- Akinci). The Committee studies the ways in which education can contribute to peace, to reconciliation and to fight against prejudice, discrimination, racism, xenophobia, extremism etc. Meetings between students’ and teachers’ from both communities will also be conducted. Also, it is very important that the Committee will consider the issue of the school books and find exactly the best practices that can be used. What Turkey should do is to support this effort and leave the Turkish Cypriots to work with us to solve this problem. Let me tell you something else: There were mistakes in the past by both communities. Our own community, with President Cliridis, if I remember correctly, had apologized to the Turkish Cypriots for any suffering we caused to them. Still we expect the Turkish Cypriots to apologize for the sufferings they have brought us, which is something that has not been done so far. Education is one of the forms of practicing cultural diplomacy. In the case of the so- called "Turkish Republic of Northern Cyprus" pseudo-state although it has not received recognition from any other state except Turkey, however, it participates in the Organization of Islam Cooperation in a state- observer status and has achieved to sign educational agreements with numerous universities members of Islamic World. What does this mean for the aspirations of Cyprus? What is Cyprus response to the above situation? This status does exist. The pseudo-state got this status thanks to the efforts of Turkey and Mr. Ihsanoglou- a Turkish Secretary General of the Islamic Organization of Northern Cyprus whose role had always been to undermine the Republic of Cyprus and to promote the Occupied Area using even obsolete practices that lead to problematic reports of the situation in Cyprus. More certainly, the resolutions of the Organization, come in contrast to Security Council resolutions 541 and 550 according to which the pseudo-state is an illegal entity and all the other countries may not to recognize it or to upgrade it. The participation of the Turkish Cypriot community, because this is what basically happens, in the Organisation of Islamic Cooperation as an alleged member-observer is illegal because it was a problematic process in 2004 in violation of the 541 and 550 forced by the Security Council resolutions. Fortunately, there are countries that are friends of the Republic of Cyprus. I can mention Egypt, for example, which always puts written reservation against such resolutions and other friendly countries which express their disagreement with the so- called "Turkish Democracy of Northern Cyprus" because all this is contrary to the Security Council. All these countries that participate in the UN and in rotation onto the Security Council cannot act in international organizations in a way that would come in contrast to their participation in the Security Council. So these references are invalid and without legal effect. Of course there are countries that for their own reasons for promoting such cooperation with the occupied, but is limited. Your career is dedicated to international relations. What would you advise young people interested in careers in the field of international relations and diplomacy? In a word ... DO IT !!! They should always care for politics both within and outside their country. Relations between states are exciting because they depend on factors that can change radically. There are not friendships. There are only interests that candidate diplomats need to understand. Especially if they come from countries with problems like Cyprus and Greece should further be interested in public affairs. Seek to find a platform through which you will express your opinion, fight to bring change and diplomacy certainly will offer you the opportunity. But the most important, you should study very much, show unique interest and believe in yourselves, your abilities and the just demands of the race that you will take.